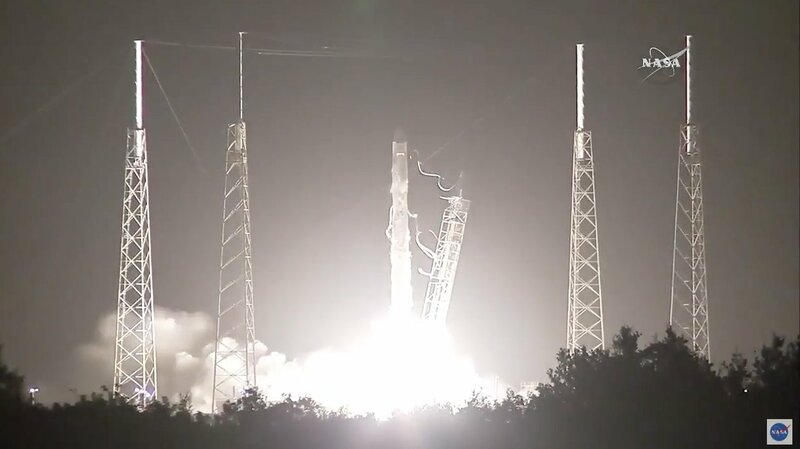 Instruments to perform the first-ever DNA sequencing in space, and the first international docking adapter for commercial spacecraft, are among the cargo scheduled to arrive at the International Space Station after Monday’s launch of the SpaceX Commercial Resupply Services-9 (CRS-9) mission. SpaceX’s Dragon cargo craft launched at 12:45 a.m. EDT on a Falcon 9 rocket from Space Launch Complex 40 at Cape Canaveral Air Force Station in Florida with almost 5,000 pounds of cargo. The spacecraft will be grappled to the space station at 7 a.m. Wednesday, July 20, by NASA astronaut Jeff Williams, supported by NASA astronaut Kate Rubins. The mission is the company’s ninth cargo flight to the station under NASA’s CRS contract. Dragon’s cargo will support dozens of the more than 250 science and research investigations during the station’s Expeditions 48 and 49. DNA testing aboard the space station typically requires collecting samples and returning them to Earth. The Biomolecule Sequencer seeks to demonstrate, for the first time, that DNA sequencing is feasible in microgravity using a crew-operated, miniaturized device to identify microbes, diagnose diseases, monitor crew health and possibly help detect DNA-based life off the Earth. Maintaining safe temperatures is difficult in space where there is no atmosphere to moderate the extreme heat and cold provided by direct, unfiltered sunlight. The Phase Change Heat Exchanger, a NASA investigation to test temperature control technology for future spacecraft, uses a continual process of freezing and thawing to maintain temperatures inside a spacecraft, thereby protecting crews and equipment. The crew also will test a new efficient, three-dimensional solar cell. Millions of Americans experience bone loss resulting from disease or the reduced effects of gravity that can occur in immobilized patients. New ground-based studies are using magnetic levitation equipment to simulate these gravity-related changes. Research delivered under the station’s role as a U.S. National Laboratory includes OsteoOmics, a test to determine whether magnetic levitation accurately simulates the free-fall conditions of microgravity by comparing genetic expression in different types of bone cells. Improved understanding of the mechanisms behind bone loss could lead to better ways to prevent it during space missions. This also could contribute to better prevention of, and treatments for, bone loss as a result of diseases like osteopenia and osteoporosis, or from prolonged bed rest. Another National Lab investigation called Heart Cells studies how microgravity changes the human heart, and how those changes vary from one individual to another. Future exploration of the moon, asteroids or Mars will require long periods of space travel, which creates increased risk of health problems such as muscle atrophy, including possible atrophy of heart muscle. Heart cells cultured aboard the space station for one month will be analyzed for cellular and molecular changes. Results could advance the study of heart disease and the development of drugs and cell replacement therapy. Dragon is scheduled to depart the space station Monday, Aug. 29. After splashdown in the Pacific Ocean, west of Baja California, more than 3,300 pounds of science, hardware, crew supplies and spacewalk tools will be returned to shore. For more than 15 years, humans have lived and worked continuously aboard the International Space Station, advancing scientific knowledge and demonstrating new technologies, making research breakthroughs not possible on Earth that will enable long-duration human and robotic exploration into deep space. A truly global endeavor, more than 200 people from 18 countries have visited the unique microgravity laboratory that has hosted more than 1,900 research investigations from researchers in more than 95 countries.